Louisville Metro Government has entered into a development agreement with the Louisville Urban League to redevelop Heritage West, a property in the Russell neighborhood. The master plan for the 24-acre site features a multi-sport facility anchored by a 4,000-seat indoor and outdoor track and field complex. 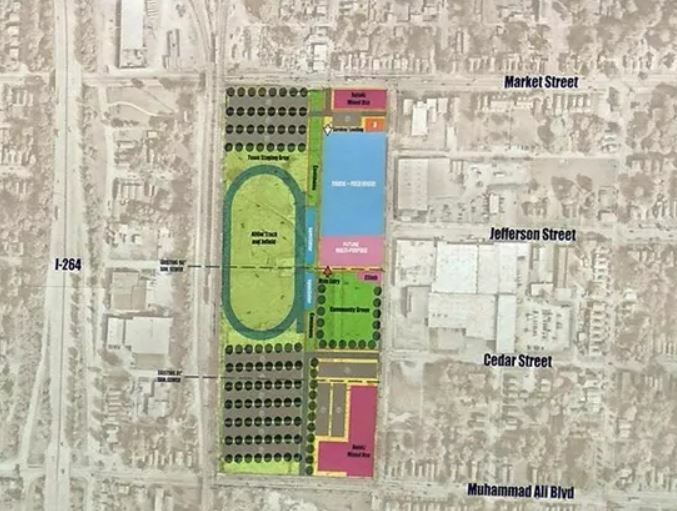 “It’s an exciting time to be in west Louisville as it is experiencing nearly $1 billion in investment right now, and we are thrilled to add this sports and education complex to the list,” Mayor Greg Fischer said. The complex will be designed to host sporting events backed by organizations such as the NCAA, USA Track and Field plus local and regional public and private schools and track teams. Retail space and related amenities are also featured in the site plans and will be owned and operated by the Louisville Urban League. Construction on the project is expected to begin in 2019. Located on the western border of the Russell neighborhood, Heritage West is another economic development project in a neighborhood that has seen an influx of investment recently: The $29.5 million redevelopment of Beecher Terrace, a project the city hopes will leverage at least $200 million in new investment; phase four of the Waterfront Park expansion; a new YMCA at 18th and Broadway; and Louisville’s first Bus Rapid transit line.